The best wine opener is called a waiter’s wine opener, and it’s shown in Figure 1. It has a sharp blade, a corkscrew or worm, and a bottle opener. This wine opener can be found in most liquor stores or bar supply houses. Figure 1: A waiter’s wine opener. There are two types of shakers, and both are shown in Figure 2. The Boston shaker is the one that most professional bartenders use. It consists of a mixing glass and stainless steel core that overlaps the glass. The Standard shaker usually consists of two or more stainless steel or glass parts and can be found in department stores or antique stores. Many of these shakers come in different shapes and designs. Figure 2: A Boston shaker and a Standard shaker. 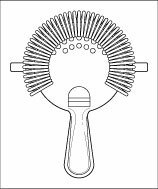 A couple of different types of strainers are available, but the most popular is the Hawthorn, shown in Figure 3. The Hawthorn is a flat, spoon-shaped utensil with a spring coil around its head. You can use it on top of a steel shaker or a bar glass to strain cocktails. Figure 3: The Hawthorne strainer. Here are some additional tools that you may need. Many are shown in Figure 4. Bar spoon (1): A long spoon for stirring cocktails. 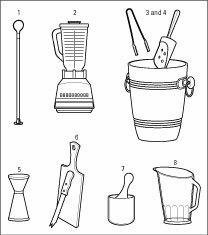 Blender (2): There are many types of commercial or home blenders with various speeds. Always put liquid in first when making a drink. This will save your blade. Some blenders (but not all) can be used to make crushed ice. Check with the manufacturer or buy an ice crusher. Coasters or bar napkins: These prevent rings from developing on your bar and other tables. Napkins also help your guests hold their drinks. Ice bucket (3): Pick one that’s large enough to hold at least three trays of ice. Ice scoop or tongs (4): A must for every bar. Never use your hands to scoop ice. 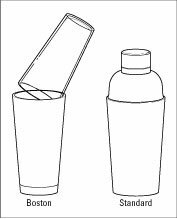 Jigger or measuring glass (5): A small glass or metal measuring container with usually a 1/2 oz. measurer on one side and a 2 oz. measurer on the other. Knife and cutting board (6): You need a small, sharp paring knife to cut fruit. Large water pitcher: Someone always wants water. Muddler (7): A small wooden bat or pestle used to crush fruit or herbs. Pourer (8): This device gives greater control to your pouring. A variety of different types is available, including some with a lidded spout, which prevents insects and undesirables from entering the pourer. Stirrers and straws: Used for stirring and sipping drinks. Large cups or bowls: Used to hold garnishes, such as cherries, olives, onions, and so on. Figure 4: A collection of bar tools.